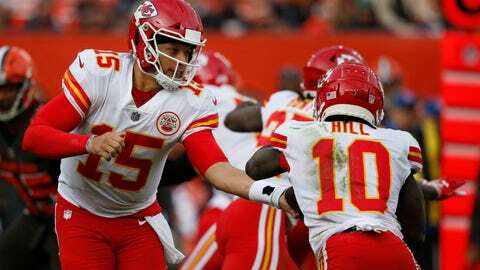 Quarterback Patrick Mahomes hands off to wide receiver Tyreek Hill, one of countless wrinkles in a complex Kansas City offense. KANSAS CITY, Mo. — There are times when Dolphins coach Adam Gase hears about a cool play that happened somewhere else in the NFL, or something unique that a rival might be doing, and he makes a note to himself to check it out once his day-to-day work is complete. Patrick Mahomes and Co. have certainly captured the attention of the league. The Chiefs lead the NFL in scoring at more than 36 points per game. They have its reigning rushing champion in Kareem Hunt, the league’s fastest wide receiver in Tyreek Hill, the most versatile tight end in Travis Kelce and plenty of depth behind all of them. Then there’s Mahomes, who can break Andrew Luck’s single-season NFL record with his ninth straight 300-yard passing game Sunday against Arizona. The first-year starter has thrown 29 touchdown passes, two shy of Len Dawson’s 54-year-old franchise record, and he leads the league in most meaningful statistical categories: yards, TD passes, touchdown-to-interception ratio. Wilson has reason to watch Kansas City, considering he has so many friends still on the roster. But it still speaks volumes that in the midst of his own preparation, he finds time to tune in. Then again, it’s hard for his coach to complain when Gase is doing the same thing. Alex Smith also has plenty of friends on the Chiefs, including Mahomes, who stepped into his job when Kansas City traded the veteran to the Redskins in the offseason. Smith helped to mentor the Texas Tech standout when he was a wide-eyed rookie, and he takes pride in Mahomes’ success. When the Chiefs rallied in the fourth quarter for a Monday night win at Denver earlier in the season and Mahomes took on a starring role in prime time, Smith was watching from his home near Washington, D.C.
That game against Denver was the most-watched Monday night game that didn’t involve the Cowboys since Week 16 of the 2016 season. When the Chiefs played the Patriots on Sunday night a few weeks ago, it earned a 12.3 rating and 21.1 million viewers for NBC, an increase of 31 percent from last year. In the Kansas City market, about half of the TVs are tuned into the Chiefs whenever they’re playing. “It’s been a lot of fun, frankly, for me and I think everybody who is a Chiefs fan to see all the interest in the Chiefs,” team owner Clark Hunt said. “That’s a credit to the success we’ve had. That interest is not only here locally, but it’s really nationally. It seems like everybody who went to Texas Tech is all of a sudden now a Chiefs fan, which is great. The Chiefs will get plenty more exposure this season, too. NOTES: Safety Eric Berry (heel), LB Anthony Hitchens (ribs), C Mitch Morse (concussion), WR Sammy Watkins (foot) and OL Cam Erving (illness) did not practice Wednesday. … FS Daniel Sorensen could make his season debut Sunday. He was activated from IR this week after breaking his leg in training camp.